There’s nothing like red and white peppermint candies to get you in the holiday spirit. At The OFFICE Tavern Grill in Morristown, we will sprinkle a little peppermint love onto your warm peppermint mocha coffee. If you are a dessert person you can always head to The Black Horse Pub in Mendham, NJ for a warm piece of our famous chocolate cake with crushed candy canes at this time of year! We know the holidays will get you in the mood for this seasonal treat, so here are a couple of recipes to satisfy your sweet tooth for candy canes. These cream puffs might take a bit more time to make than, say, holiday cookies, but they’re worth the effort. Crushed candy canes and a hint of mint extract are the highlights of the pastry cream. Serve this at your next holiday party—or give some as a gift! Long a favorite, this simple recipe is made with just a few key ingredients—white chocolate, candy canes and ½ teaspoon peppermint oil. Great for holiday celebrations or a gift exchange! What a great way to wake up on Christmas morning! Sprinkle some red and white food coloring onto your pancake batter, then make the chocolate syrup. It’s a blend of crushed candy canes, unsweetened cocoa powder, bittersweet and semisweet chocolate. Your kids will savor every bite. 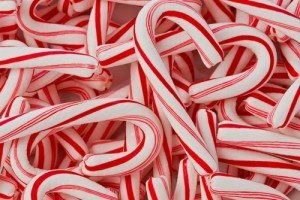 Yes, you can “drink” your candy canes! Make this martini for friends at your next holiday gathering. They will be impressed by the drink’s simple beauty. The recipe calls for a small amount of vanilla vodka, white crème de cacao and peppermint schnapps. Garnish the rim of the glass with peppermint candy for a festive touch. This delicious recipe makes chocolate sandwich cookies with a peppermint filling. Be sure to make plenty of extras, because these cookies will go fast!